Every garage door will eventually suffer from some type of problem. Our team can help you deal with any kind of issue, regardless of how intricate it may be. Remember that these systems are incredibly dangerous, and should never be handled by amateurs. Every hardware part of your garage door is susceptible to wear and tear damages. These systems are under a lot of stress, and eventually something will break and need to be replaced. Your track, for example, can develop bends or become blocked by debris, which will prevent your door from moving. We can straighten your track and restore your door to its proper operation quickly and efficiently. Garage door openers can suffer from a wide variety of issues, from worn out motor gears to a fried circuit boards and even a broken trolley or an unadjusted chain-drive. No matter what the issue your experiencing is, you can always rely on our team to provide you with an affordable and effective solution. The springs that support the weight of your door panels are under a lot of tension. That's why they must only be handled by experts. They can cause serious injuries when they break, and may even cause the door to collapse altogether. Needless to say, you don't want that to happen. Make sure to reach out to our team to get your springs replaced by professional technicians. 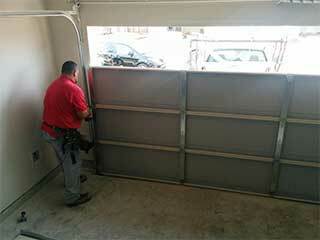 Our experts at Garage Door Repair Riverdale can fix any type of problem you may experience. We work with all the main name brands, and can repair openers of every make and model. Call us today.